Is the AL East becoming strong on pitching? Is Tampa Bay's Matt Moore leading the revolution from the AL East being a power-hitting division to a more savvy, pitching division? McGILLIGAN: If the opening games of the 2012 season are any indication, the big bats in the AL East may take a back seat to the emerging arms. The young hurlers of Toronto and Tampa Bay have the lumber of the Yankees and Red Sox reeling. The numbers don’t lie. Tampa Bay (4-1)* followed by Toronto (4-2) sit atop the division with the Yankees and Baltimore Orioles tied (3-3) and the Red Sox sitting in the basement at 1-5. Offensively, the teams are fairly close with only seven runs scored separating first from last. The difference resides in pitching. The Red Sox are the worst in almost all of the categories from ERA and runs allowed to converting save opportunities. They’ve had three poor pitching starts (Beckett, Buchholz and Bard), ad have blown two save opportunities according to MLB.com. Now look at the top two teams. The Rays have allowed the fewest runs (19) and have converted all three save opportunities. The Jays have had solid pitching performances from the starters and the lowest ERA (2.57) in the AL East, sixth best in MLB and have only given up one more run than Tampa even though they’ve played one more game. Oh yeah, the team has blown two saves, if not for that they’re sitting at 6-0. Now, we have to consider a few things, the hitters will warm up and the Red Sox – no matter what anyone says still have one of the most potent lineups in baseball – will certainly start to hit the ball better. The real question will be which type of pitching will win out. The Rays and Jays are trotting out young starting staffs versus the Yankees and Red Sox more veteran pitchers. Of the four teams – I’m not trying to disrespect Baltimore I just never believe they will hang around for a full season – the Jays have the most unknown quantities in Kyle Drabek, Henderson Alvarez and Dustin McGowan, when he returns. Alvarez and Drabek looked good in their starts, but have not been through the grind of a major league season. Will the young arms hold up, how will they handle adversity? We don’t know, yet. 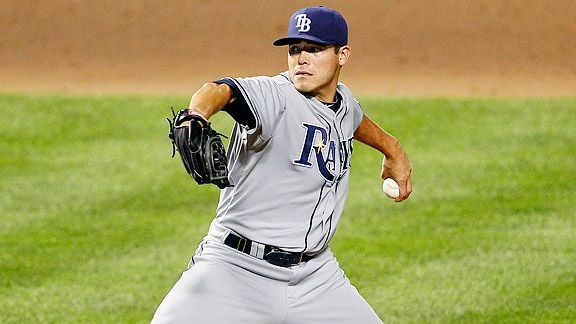 Tampa gets a slight edge for me over the Jays staff because even their youngest hurler Matt Moore, has the pressure-packed playoffs under his belt and has shown he can handle it. For Boston, Lester has been solid in his starts, the bats simply didn’t show up. Doubront was good against the Jays while Beckett and Buchholz were not. Bard should be in the pen, I don’t think his stuff is suited to start. As for the Yankees, CC Sabathia is, well Sabathia, he’ll be fine and log a tonne of innings, but Pineda and Hughes are unknown quantities at this point. All this considered, the Rays look the best suited given the depth of the staff and experience of even their youngest player. The Jays are a close second, but I had to rank them behind the Rays because of the uncertainty of the fifth starter position and inexperience of the 3-4 guys (despite impressive starts). So while the Yankees and Red Sox loaded up on bats to do battle; it appears the arms of the Rays and Jays could make the Boston-New York cold war a non-factor. *All numbers as of noon April 12.